When it comes to weight training, getting a pump is one of the most satisfying feeling when you are training. Taking a nitric oxide supplement can provide a better pump for your workout. But, which nitric oxide supplements have been said to be effective? Nitric Oxide is a molecule that is naturally produced by most different cell types in the body. Nictric oxide helps maintain healthy blood flow by relaxing the inner muscles of the blood vessels which allows for blood to flow through easier . The dilation of blood vessels makes the work load for heart less as it doesn't have to work as hard to pump the blood. There are no proven studies, but it has been said that increasing blood flow provides the active muscles with more nutrients and oxygen. Nictric oxide supplements do not contain nitric oxide itself but contain ingredients that can help stimulate the production of NO. L-Arginine and L-citrulline are two of the most common ingredients. When To Take A Nictric Oxide Supplement? To get the best results from a NO booster, it is recommended to take a serving 30-45 minutes before your workout, with a pre-workout or on its own if your are trying to avoid stimulants. You can also take a NO supplement first thing in the morning if you are using it as a general dietary supplement. There are no proven studies to say that it is more beneficial to cycle a NO booster. It is a dietary supplement that can be taken on a daily bases as it also provides many health benefits too. Supplementing with a NO booster can increase your exercise capacity. NO naturally occurs in the body but using a NO supplement can increase the NO production to ensure the benefits are provided. If your blood pressure is irregular or you have a heart condition, you should consult a healthcare professional before using a NO supplement. ​​Some studies have shown that supplementing with a vasodilator can reduce the risk of clogged arteries as nitric oxide relaxes or dilates blood vessels allowing for easier blood flow so the heart doesn't have to work as hard to pump the blood, which can prevent hypertension. It has been said that nitric oxide provides anti-inflammatory properties too. ​Nitric oxide plays an important role in almost every biological system and is known to be one of the most versatile components of the immune system as it is involved in the control of infectious diseases. It is beneficial for people with type 2 diabetes to increase nitric oxide production as a study showed that insulin sensitivity increased after boosting nitric oxide, which improved the control of blood sugar levels. There are no studies to back this statement but it has been said that increasing NO production may increase the amount of nutrients and oxygen that is delivered to the active muscles to boost physical performance and recover faster. Studies have been done on animals that have shown that NO plays a role in a variety of neuronal functions, such as memory and learning processes. Findings have shown that NO can increase the amount of GABA that is released which may stimulate the pituitary gland to produce more HGH . Optimal production of GABA is crucial when it comes to building muscle, burning fat, anti-aging and for your general well being. Increasing your HGH productions provides many health benefits like enhanced mood, stronger tendons, increased exercise capacity, improved bone density, less risk of cardiovascular disease and it even improves your cognitive function. Nitric Oxide is also really beneficial for the liver as it protects from ischemic damage. Research suggests that natural NO supplements are safe to consume within the recommended dosages. There are many supplements on the market labelled as NO boosters that do not actually contain NO but instead contain ingredients that stimulate the production of nitric oxide in the body. L-arginine and L-citrulline are two of the most effective and well known amino acids for stimulating the production of nitric oxide. Exercise increases blood flow which is beneficial for enhancing the endothelial function. There is a single layer of cells that line the blood vessels which is known as the endothelium. Exercise stimulates these cells to produce more nitric oxide to ensure that your blood vessels are healthy. If the body's nitric oxide production is insufficient, the endothelium can't function properly which may contribute to risk of a heart disease. Another way to naturally stimulate your body's nitric oxide production is to consume foods that are high in nitrate.Vegetables are a good source of nitrate, which is why vegetables are good for you. About 80 percent of your nitrate intake comes from vegetables. Nitric oxide gets broken down quickly by the body and doesn't stay in the blood stream for long but the consumption of antioxidants will minimize the break down of NO in the blood. L-citrulline (non essential amino acid) is converted into an amino acid called L-arginine in the kidneys to help stimulate nitric oxide production. Nitric oxide plays a key role in maintaining blood vessel and heart health. L-citrulline can improve stamina, energy levels, fatigue resistance and recovery. It recommended to take 3-8 grams of l-citrulline 30-45 minutes prior to exercise. L-arginine (non essential amino acid) is used by the body to produce nitric oxide. It also has muscle building properties which include increased growth hormone levels, protein synthesis and reduced muscle breakdown. A dosage of 2-3 grams can be consumed 30-45 minutes prior to exercise. 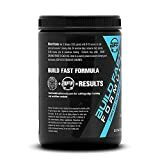 Build Fast Formula is a new supplement brand to the fitness industry but they have grown quickly as their supplements have great formulations with highly dosed ingredients to ensure the effectiveness of their products. VASOBLITZ from Build Fast Formula is a stimulant free pre-workout that is formulated with optimal dosages of vasodilators to improve nitric oxide production allowing for better blood flow to increase muscle pumps during your workouts. Although VASOBLITZ is new to the industry it has a good rating from the reviews from amazon. VASOBLITZ has a net weight of 465 grams which provides 30 servings per container. A serving is 2 scoops (15.5g). It is recommended to take one serving with 8-10 ounces of cold water 30-60 minutes prior to your workout. Genius Pre is a stimulant free pre workout formulated by The Genius Brand. They focus on sourcing the best quality raw ingredients and formulating products at clinically proven dosages to ensure the benefits of their products. Genius Pre pre workout by The Genius Brand has a net weight of 354 grams, which provides 20 servings per tub. It is recommended to mix 1/2 a serving (1 scoop) with 14 ounces of water 30-45 minutes prior to your workout. Depending on your tolerance you can take a full serving (2 scoops) instead. Sheer Strength Labs is relatively new to the fitness industry but are one of the fasted growing sports nutrition companies is the U.S. Reason being is that Sheer Strength Labs is a quality drive brand that provides effective sport nutrition to achieve your desired goals. Generally companies use propriety blends to hide the low-quality ingredients used to formulate supplements. Sheer Strength Labs formulates their products according to proven science and with no propriety blends to show you the exact dosages of each ingredient. Sheer Strength Labs only use clinically proven dosages to ensure the effectiveness of their products. 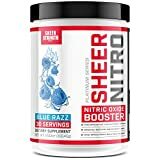 Sheer Nitro comes in a 366.45 gram tub that provides 30 servings. Mix 1 serving (12.2g) with 12 ounces of water 30-45 minutes prior to your workout. PUMPSURGE by Jacked Factory which is also a fairly new brand that don't have a huge variety of products yet they have become well known for formulating all their supplements with effective ingredients at scientifically-proven doses to ensure the results of each and every product is provided. Their products are manufactured in a cGMP certified facility in the USA to ensure the quality of the supplements. Jacked Factory is also health conscious as the don't use artificial food dyes and fillers. 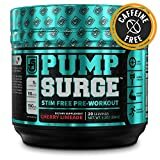 PUMPSURGE provides 20 servings per tub. Mix a serving (1 scoop 13g) with 8-12 ounces of water 30-40 minutes prior to your workout. 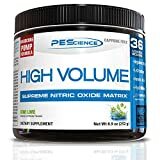 High Volume by PEScience is a caffeine free pre workout that is formulated with vasodilators to increase blood flow to the muscles that are being trained to give your a better pump during your workout. PEScience focuses on research and development to ensure they find the best quality and effective ingredients before formulating products. PEScience product labels are reviewed and approved for accuracy and compliance to guarantee quality products. PEScience provides 18 servings per tub. High Volume comes is 5 different flavors to choose from. Mix 1 serving (2 scoops) with 8-12 ounces of water 30 minutes prior to your workout. 250mg of Vitamin C - Assists in the repair of tissue as well as the enzymatic production of neurotransmitters. We hope the information we have provided give you a better idea of what to look for in a nitric oxide boosting supplement. Any of the products listed are great a choice so it just comes down to personal preference of brand and your budget. VASOBLITZ by Build Fast Formula is our top choice for a stimulant free pre workout.